When we went apple picking on Sunday, there were bins and bins of pumpkins. I actually had no idea that Robbie even knew what a pumpkin was, but he kept trying to get into the bins to get one to take home. We settled on getting a knit pumpkin hat (which he chose over the apple hat). I wasn’t too sure what to expect with regard to the hat. Mostly, I figured we’d take it home and he would forget about it. I mean, isn’t that how it works? You spend money on something and the kid forgets about it fifteen seconds later. Knowing about Robbie’s attachment to pumpkins, I decided to buy him one at the grocery last night. Initially, I was going to get one of those painted mini pumpkins. You know, the kind that’s $5.99? Yeah. The big, unpainted pumpkins? Those were only $5.00 apiece. So, Robbie got a big pumpkin. I snuck into his room last night and left it on his armoire, right next to ‘Ish where Robbie would see it when he got up. 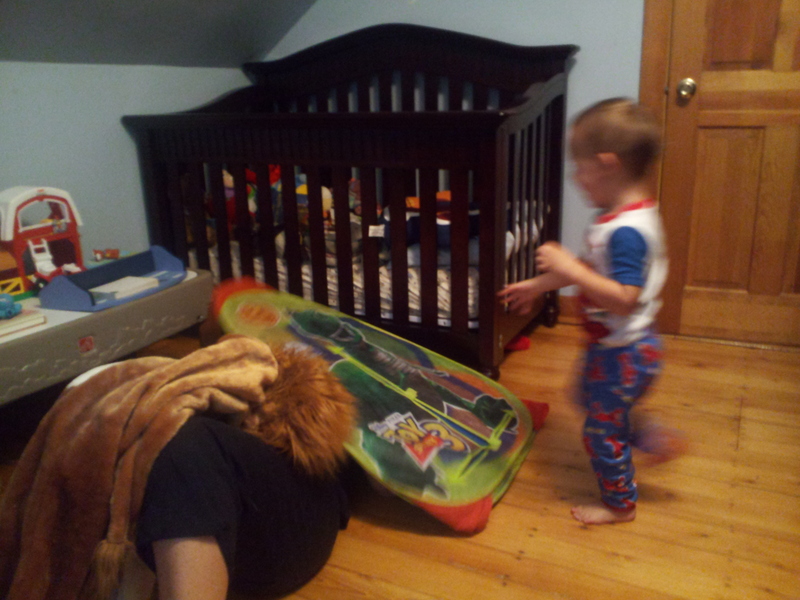 I heard Robbie stir and then he shot up in his crib and yelled, “Punkin! Mama! Punkin! QiQi punkin!” Fortunately, I was there to grab him before he climbed out of his crib to get to it. He has decided that the pumpkin has a booboo and likes to kiss it on his way into and out of his room. I just hope I can sneak it out before it starts to rot and ruins the furniture. Justin’s keys, watch, and ring went missing sometime on Sunday. They were still missing on Monday. And on Tuesday. Fortunately, I pay attention to everything Justin does and noticed that he took my keys when we drove to dinner Sunday night. When I left the house Monday morning, I doubled back to leave Justin a spare car key. I could only imagine the panic that would set in if he didn’t find his keys and had to get Robbie to daycare, Hilary and her friend to the airport, and himself to the gym. As the days passed without any sign of his items, Justin grew increasingly frustrated, sure that they would never be found again. I’m not quite sure where he thought they would be, but he just knew that they had left the house. Now, I don’t know where the inspiration came from, but on Tuesday it occurred to me a new hiding spot for Justin’s beloved possessions. It occurred to me that we needed to find all of my purses and search them. You may remember that Robbie puts anything he needs when he leaves the house in my purse. Unfinished cups of milk, peeled bananas, cars, Smurfs, bananas. So, why not keys, a ring, and a watch? After all, those are the things Justin takes with him when he leaves the house, and everyone knows the stuff you need goes into the purse. It took Justin about twenty minutes to find my brown purse. As he started to go through the pockets of my purse, he uncovered his keys. And his watch. And his ring. All tucked carefully inside, where he would be sure to have them if we left the house with the purse. Makes perfect sense, doesn’t it? I’m not sure how the time passed so quickly, but my favorite seester’s visit has come and gone. And I want to cry. It was so nice to have her here, to actually have family close by. Even if it was just for a few days. I told Hilary I wanted to be at daycare when she saw Robbie for the first time, to see him smile when he realized that she had actually come. He’s been asking for her for weeks, and she was finally here. Hilary was convinced that he wouldn’t remember her, but he did. He knew exactly who she was and didn’t stop talking about his Hal-a-ree all weekend. Today, as soon as I picked him up from daycare, Robbie looked at me and said, “I want Hal-a-ree, Mama.” And you know what? So did I. 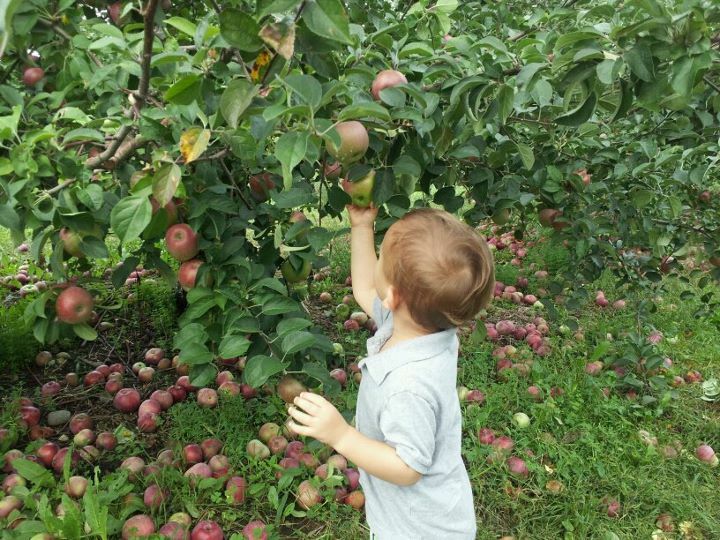 It wouldn’t be fall without apple picking. 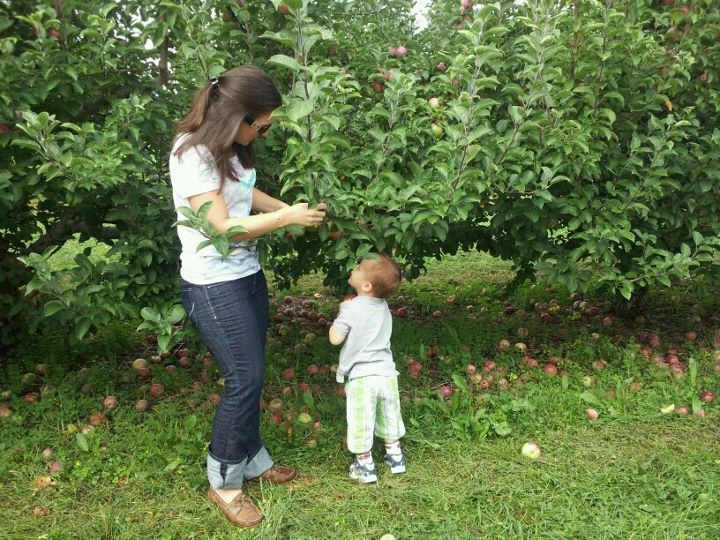 And it wouldn’t be apple picking without Aunt Hilary. We headed to central Massachusetts to Sholan Farms for a little adventure. 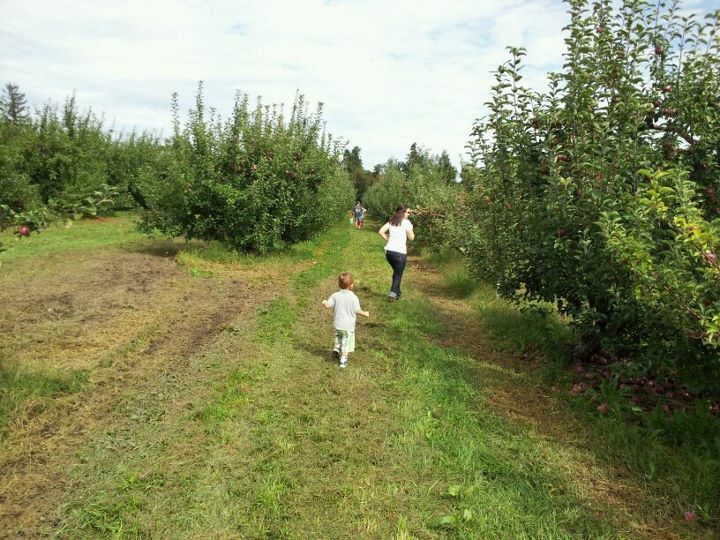 Last year, Robbie had just learned to walk when we went to the orchard and he had a blast teetering around on the uneven ground. But he didn’t really get the whole apple picking thing. Buddy, he got it yesterday. 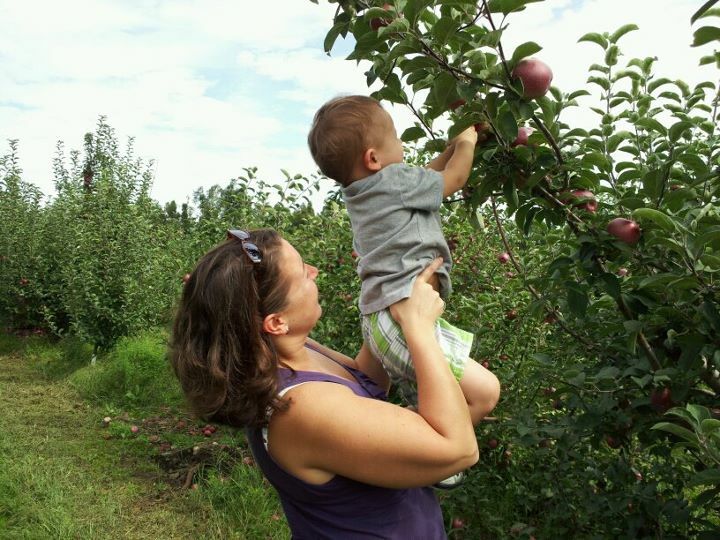 Robbie made a beeline for the trees, reaching up to grab his first apple. After all, you forget that ping guo is his favorite food. He knew EXACTLY what was going on. And he couldn’t get them in the bag fast enough. Everything is more fun with Aunt Hilary around. Even running down the rows of the trees is more exciting with a super fabulous aunt to chase. 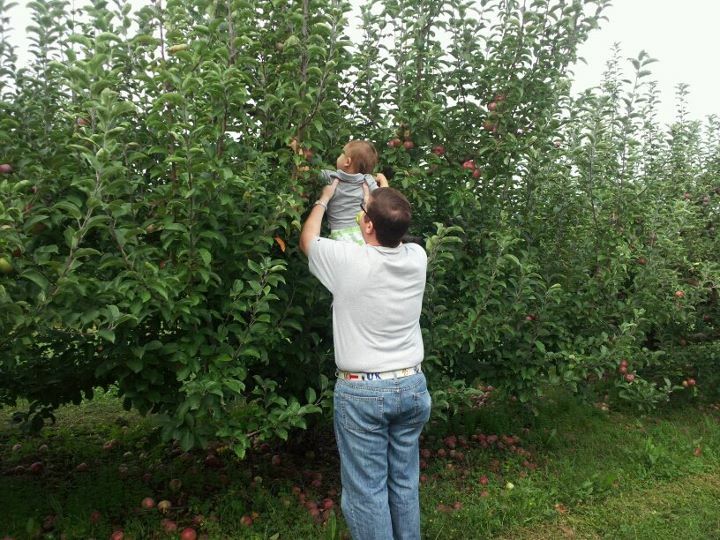 He did manage to sit still enough to let Justin and me hold him up for a few apples, too. Unfortunately, we couldn’t keep Robbie from trying to sink his pearly whites into every single apple he picked. This did, however, make for a great excuse to make an apple crisp, which proved to be delicious. Aunt Hilary flew into town yesterday afternoon, much to Robbie Manna’s delight. He has been talking about “Hal-a-ree” all week, sure that each day was the day she was really going to come to see him. Last night, he couldn’t get enough of her and didn’t want to leave her side. After getting Hilary from the airport, Robbie from daycare, and me from Lawrence, Justin drove us up to the beach in New Hampshire to have dinner. Sure it was foggy. Sure it was rainy. But the lobster rolls were still fabulous. And, perhaps more importantly, the crowds of summer were gone and we had the entire covered deck to ourselves. After dinner, it was off to the arcade on the beach and time to win tickets to ear Robbie prizes that he surely couldn’t live without. Of course he needed a stuffed Smurf to go with his collection of toys from Joe’s Playland, namely a prized Elmo and Cookie Monster. Yesterday, as I was trying to get out the door to go to work, Robbie discovered my “gogurt” on the counter. Thrilled at the find, and sure that it was for him, he ran around the house with his trophy. Eventually, I convinced him that the yogurt was mine and asked him to please put it in my purse. Then, in a novice move, I turned my back to get the rest of my things together. I could have gone on but decided to cut my culinary losses and head for work without the yogurt to accompany my cereal (it’s better than milk, by the way; much more filling). And then Robbie flipped out. Par for the course, I know. He started screaming about purses and gogurt and ping guos. Being patient, I tried to rationally explain, “We don’t have the yogurt. You didn’t put it in my purse and we can’t find it. We have to go.” I even went so far as to give him a small black purse, which looked fabulous with his Smurf shirt. And then Robbie made a mad dash for the bathroom and stopped by the door to the linen closet. Where another purse hung. With my yogurt nestled snuggly in one of the pockets. So, Robbie’s really into his birthday suit. Super into it. Justin and I went to check on him the other night and found that he had stripped completely naked before passing out in his bed. On top of all of his toys AND his collapsed tent. 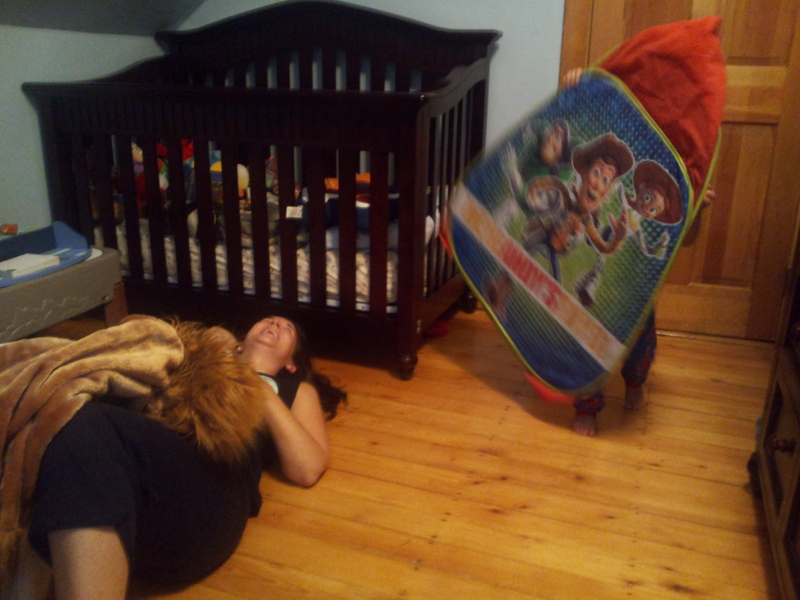 When we tried to get him up to get dressed, he rolled over in protest, tucking his legs up under his body. Eventually, we were able to get him pajamaed and diapered and tucked back into bed where he slept soundly for the rest of the night. We’ve started the brainwashing early at the Manna household. Justin and I firmly believe it is our responsibility to “raise ’em young; raise ’em right.” And so, with the help of Pops, we started outfitting Robbie in his Kentucky gear when he was five weeks old. Every time we go home, we stop to get more t-shirts and pajamas; we must make sure that Robbie has Kentucky clothing regardless of growth spurts. He has even had Kentucky “squeakers” – typical white baby shoes with the UK emblem that, you guessed it, squeak every time Robbie walks. Those have been, by far, his favorite item of clothing. It’s only recently, though, that the fruits of our labor have been evident. We occasionally hear screams of, “C-A- Go Cats! Cats! Cats! Yay!” from the back seat. Or the crib when Robbie is supposed to be asleep. He’s learning to yell “UK!” on command. And I think he might be ready for “Go Big Blue!” Maybe we’ll get to “What’s your favorite color baby?” for March madness… (“Blue and white!” is the correct response, by the way). Much to our delight, Robbie performed all of his cheers for us during the football game this past Saturday. (You can see it on my Facebook page; I still can’t get videos to upload here from my cell phone.) Ladies and gentlemen, I think we have a Wildcat! Robbie is also very aware of the UK emblem and, every time he sees it, he yells, “Go Cats!” And he loves his Go Cats shirts. In fact, last night he slept in one of his Kentucky t-shirts. 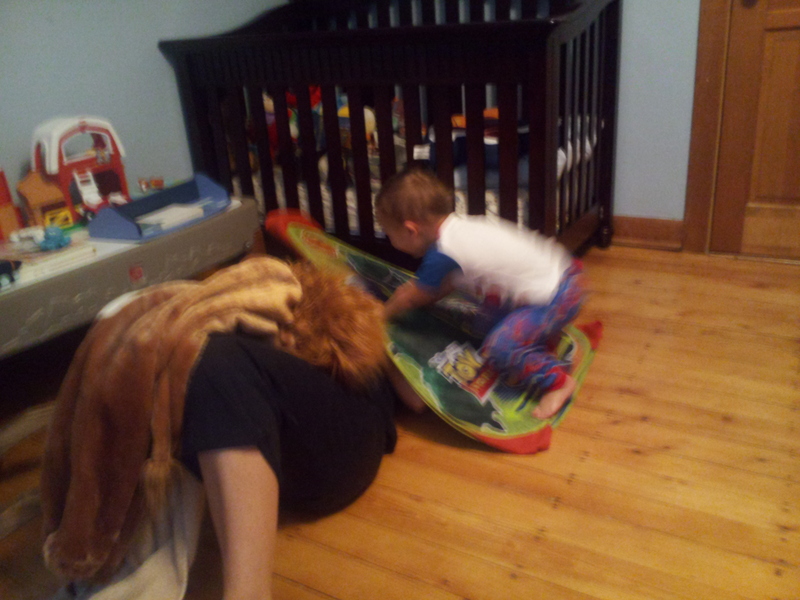 When Justin tried to get him dressed this morning, there was a meltdown. Robbie did not want to wear his “I’d rather be a dragon” shirt, which was clean and weather-appropriate. After all, the temperature has dropped almost 30 degrees in the past week. No. 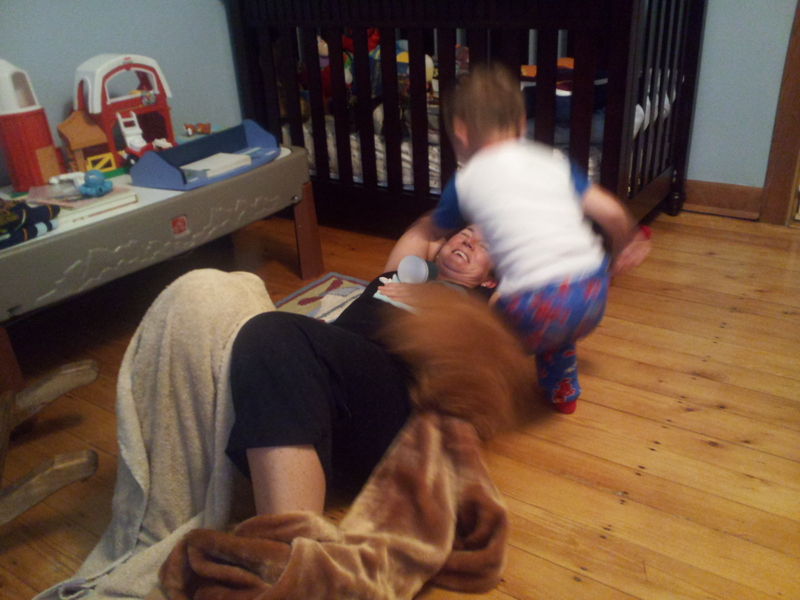 He wanted his Go Cats shirt and threw an all-out tantrum when we refused to let him wear it. He was, however, slightly mollified when I presented him with a Go Cats jacket as a compromise. Until he realized that it was only blue in color and did not say UK on it. I think we’ve created a monster… But at least he’ll be fun to watch games with. With Justin being gone so much over the past few weeks, Robbie and I have been at odds. I wasn’t sure how our Friday night would go after the long days together. Fortunately, I had something good for us to do. After all, it was Town Day night, which promised pony rides, train rides, hot dogs, and fireworks. Robbie and I headed down to the field shortly after getting home from work on Friday afternoon. We took just enough time to let Barkley out, change clothes, and grab a stroller. Then we were off for our night of fun. Robbie waited patiently in line to ride a horse, something he’d been talking about all day. When his turn came, it was with the biggest horse they had. The thing was taller than I was! He didn’t hesitate, and nearly leapt out of my arms to get on the horse’s back. After his ride around the circle, he tried to stay on a little longer, much to the irritation of the girl walking the horse. Afterwards, it was off to the fire truck where Robbie got to meet a real fireman and sit in a real fire truck. He was in heaven, sitting up in that truck like a big guy. He sat up so straight and looked so proud of himself for actually getting in the truck. I think it nearly broke his heart to have to get down. Eventually, Robbie wanted to run around like the big kids. Normally, this is fine. But, in Arlington, Town Day night is kicked off with a shaving cream fight for the middle school kids. Guess whose kid headed straight for it? Luckily, I got to him before he got trampled by crazed teenagers, and he was eventually content to watch from the outskirts. The best part of the night for me, though, was the fireworks. Robbie and I sat down on the grass together and, after a few minutes, he crept over to my lap to sit for a while. He was so still, so intent on watching the “stars” and “flowers” in the sky that he didn’t mind me cuddling with him. Eventually, like any boy, he got tired of sitting, so Robbie stood next to me, arm on my shoulder, head tilted to my head, watching the fireworks. And, just like that, all of our tense moments in the past two weeks melted away. I got a glimpse at the sweet boy I knew I had in there somewhere. It didn’t last for long. There was a meltdown at the ice cream store twenty minutes later. But, I knew. I knew that Robbie still was, deep down, a little boy who likes having fun with his mom. And for right now, that’s good enough for me. Thank goodness I stopped in to check on Robbie before he went to sleep Thursday night. I found a Gymboree bag full of books and a stuffed Cookie Monster that he had curled himself around. When I went to pull it out of the crib (I may be relaxed about a lot of stuff, but plastic bags in the crib is a line I’m not willing to cross), I discovered something that bothered me even more than a plastic bag in the crib. Robbie had strung the bag around his neck. I can’t even imagine what would have happened if I hadn’t gone in to check on him before heading to bed myself. In the morning, Robbie woke up and immediately asked for his, you guessed it, purse. I wasn’t sure which problem to address first… Plastic bags. Rope around the neck. Or the fact that my son wanted his purse. I started with the fear factor, talking to Robbie about how dangerous it was to play with bags, especially before going to sleep. I’m not entirely sure he completely understood what I was trying to say, but he did get that it was dangerous. He wouldn’t touch any of the books in the bag for two days, telling me, “Dangerous, Mama,” whenever I tried to get a book out. He did, however, readily accept the Cookie Monster he desperately wanted.